How do I Sync Tasks with Google Task Lists? The CRM's task sync will allow you to synchronize all your tasks from your CRM to Google and vice versa. In addition to the Google Tasks integration, which syncs the “Task” activity types. 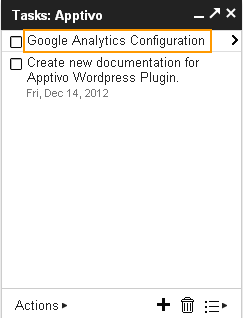 Below we will see how to start with Google Tasks syncing. In order to have Google Tasks Sync to work properly, you must set up your G suite with the CRM. 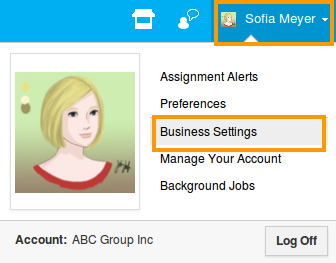 Ensure that you have enabled the Task sync option from Business Settings. How does Google Tasks integrate with the CRM online project management? All tasks created in projects app will sync to Google Tasks with the particular project folder name; the rest of the task will be synced into ‘CRM’ folder. How to create a task from the CRM and sync to Google Tasks? 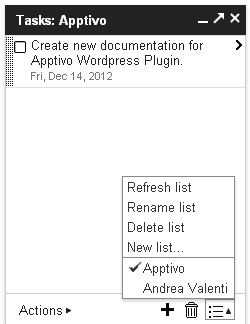 You can follow the steps below to create a task from Apptivo and sync to Google. First step is to create a Task. Select "Sync Services" from left navigation panel and slide the "Toggle" button to "Green" color to enable the Task Sync. In Homepage, Navigate left to create a new task. Now, Log in to your Google account, and navigate to Tasks. A new folder named “Apptivo” will be created into Google with Synced task. Now, Create a task from Google. Your Google Task will be synced into your CRM Task. That’s it! You have synchronized your Google Tasks with your CRM's Tasks.